Well over a billion single-use plastic bags are given out for free each day. But, nothing comes for free. Here are some of the actual costs for the fleeting convenience of unlimited, free, plastic bags. • The production of plastic bags requires petroleum and, often, natural gas - both non-renewable resources that increase our dependency on foreign suppliers and contributes to the destruction of habitats and ecosystems. • The toxic chemical ingredients needed to make plastic produces pollution during the manufacturing process. • The energy needed to manufacture and transport disposable bags eats up more resources and creates global warming emissions. 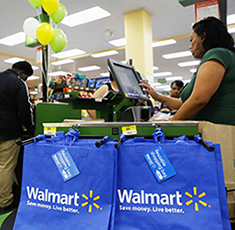 • When retailers give away free bags, their costs are passed on to consumers in the form of higher prices. 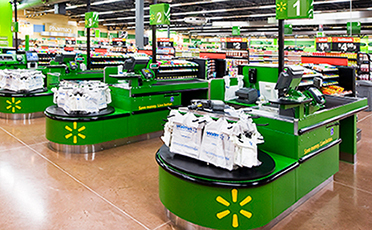 • Annual cost to US retailers alone is estimated at $4 billion. • Hundreds of thousands of sea turtles, whales, and other marine animals die every year from eating discarded plastic bags mistaken for food. Turtles think the bags are jellyfish, their primary food source. Once swallowed, plastic bags choke animals or block their intestines, leading to an agonizing death. • On land, many cows, goats, and other animals suffer a similar fate when they accidentally ingest plastic bags while foraging for food. • In a landfill, plastic bags take up to 1,000 years to degrade. As litter, they breakdown into tiny bits, contaminating the soil and water. • Japanese researchers report that plastic debris acts like a sponge for toxic chemicals, soaking up a million-fold greater concentration of such deadly compounds as PCBs and DDE (a breakdown product of the notorious insecticide DDT), than the surrounding seawater. These turn into toxic gut bombs for marine animals. • Collection, hauling, and disposal of plastic bags create an additional environmental impact. An estimated 8 billion pounds of plastic bags and wraps enter the waste stream every year in the USA, putting an unnecessary burden on our diminishing landfill space and causing air pollution if incinerated. • Recycling the plastic or paper bags requires energy for the collection, transportation, and processing. Better, but it doesn't address all of the above issues. Note: much of the above can apply to plastic cups and lids. These also have a short life span but require vast amounts of energy and space to manufacture, ship, store, and dispose of. We can literally eliminate most of the above negatives by taking a reusable grocery bag to the grocery store instead of using their plastic or paper bags. 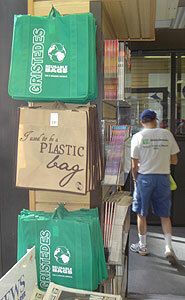 Many stores sell the reusable bags by the register. You can also buy them online. Some stores give a nickel credit if you bring in your own bag. A double whammy of savings. 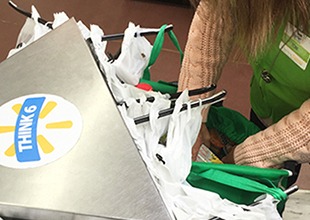 I use reusable shopping bags and keep them in the car. After I unload groceries, I put the bags back in the car or put them by the door to grab the next time I get in the car. 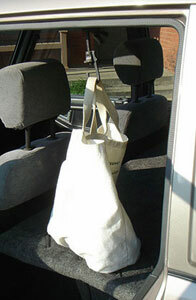 A canvas bag in the car. 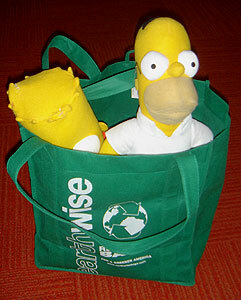 Recycled plastic bag (Bart & Homer are not actual size). Bags available in the store. If 1 out of 4 of us in the USA used a reusable shopping bag it could save 3 million barrels of oil (105 million gallons). 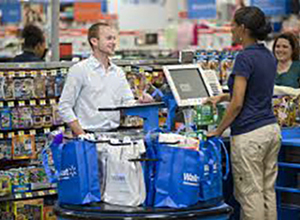 The checkout cashier trying to keep the bag open while filling it. The space is just too cramped with the plastic bags and their brackets taking up so much room. 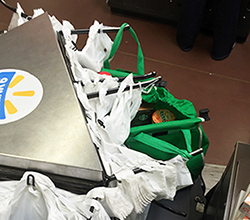 The checkout stand has a rotating rack to hold plastic bags, hundreds of them. Simple solution (that some stores are doing, but not enough) is to put plastic bags on 2 of the 3 sides and leave the third side open to place the customer's reusable bag. There can be brackets to hold the handles and to help keep the bag open. 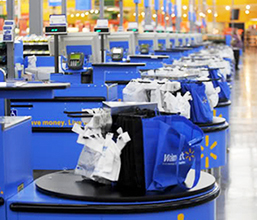 There could even be a few reusable bags hanging on that side for sale - to encourage the plastic bag customer to see and purchase.